The Arvada Police Department was featured in a Super Bowl commercial for Ford and Shield 616. 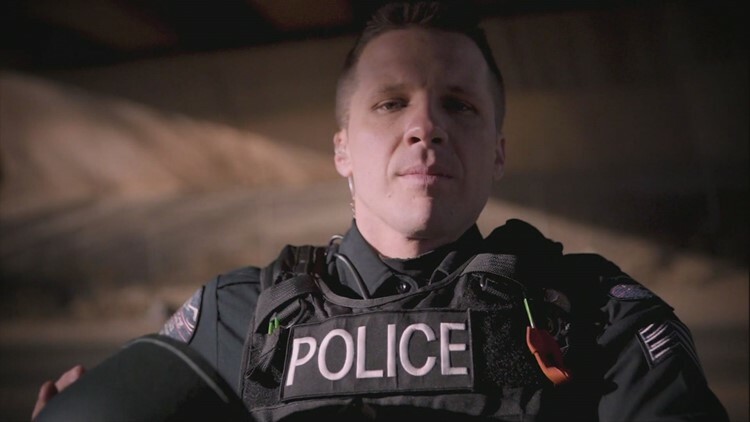 ARVADA, Colo. — The Arvada Police Department was featured in a commercial that aired during Super Bowl LIII on Sunday night. Ford put together the ad touting how its local Ford stores support the mission of the Colorado Springs nonprofit Shield 616, which provides protective equipment to law enforcement agencies. During the Super Bowl commercial, Ford said it funded 17 full armor packages for the men and women of the Arvada Police Department. The kits include a ballistic vest, helmet and a wound trauma kit, all of which is meant to better the first responders' standard issue gear. The point is to protect against assault-style and automatic weapons. The Arvada Police Department said Sgt. Chris McCoy starred in the commercial. Shield 616 was founded by Jake Skifstad, who responded to an active shooter situation at New Life Church in Colorado Springs in December 2007 and the shooting at Planned Parenthood in 2015. The organization's mission is to save first responder lives and improve the community-law enforcement relationship, according to a release from the organization. In November 2018, Denver Broncos linebacker Von Miller and his teammates donated $200,000 to a local nonprofit aimed at saving first responder lives and improving the community-law enforcement relationship, according to a release from the organization. The players' donation paid for 125 "advanced protective kits" made for police and firefighters who are responding to active or mass shooting situations.